March 1, 2009: Parliament Street, New Delhi. 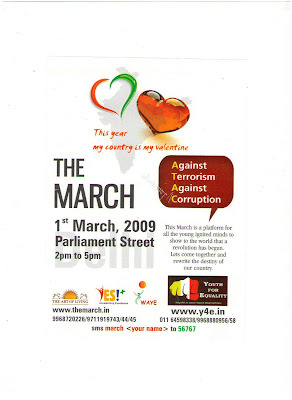 Aiming to mobilise over 1 lakh citizens to march together and raise a unified voice against corruption and terrorism. Pledging to build a corruption free nation. 1) Creating public awareness and mobilizing people, organizations and communities towards the cause of rooting out corruption and terrorism from the country. 2) Organizing a forum and an activity structure in partnership with various NGO’s, bodies to involve citizen participation (esp. Youth) in the democratic process and address social issues. India has the dubious distinction of being one of the most corrupt nations in the world, ranking a poor 45 of the 49 countries evaluated on the World Economic Forum Survey 2003 ‘Honesty’ index. A dangerous manifestation of corruption is terrorism. According to the database information released by START (The National Consortium for the Study of Terrorism and Responses to Terror) 4,108 terrorist incidents occurred in India between 1970 to 2004 which put India into sixth place in Terrorism hit nations list. More than 400 people died in terror attacks in 2008. The actual figure is unknown. As a country, we need to actively start moving in a concerted way against these twin evils that are now threatening our very existence. Youth For Equality and the Youth wing of the Art of Living, World Alliance for Youth Empowerment (WAYE) will spearhead this year-long nation wide movement, starting with this march, that will have the active support and participation of all sections of civil society including educational institutions, NGO’s, Residents’ welfare organisations, Youth groups, Social service organisations, Cultural organisations, Corporate houses, and Individuals from all walks of life. The objective is to awaken and empower people, especially the youth, to participate in the democratic process. this movement, across the nation, with a 3 fold solution: AWARENESS, ACCOUNTABILITY & ACTION. The aim is to make the youth aware of their role and propel them to bring about social transformation by active participation in the democratic process. So let us send out a call to our country to create a safe society. A society which has no fear in walking into an airplane, train, bus. Or when we enter a mall, cinema, hotel, with our children. Or our very own homes.